Hamas's "military wing" says there will be a "new explosion" unless Israel allows the reconstruction of Gaza. The so-called “military wing” of the Hamas terrorist group warned Thursday of renewed violence unless Israel allows the reconstruction of Gaza, AFP reported. 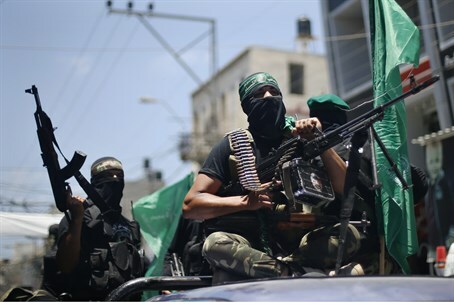 "We are saying to all sides -- if the siege on Gaza and the obstacles for reconstruction remain, there will be a new explosion," said Abu Obeida, a spokesman for the Izz ad-Din al-Qassam Brigades. The United Nations brokered a deal allowing the delivery of construction materials to Gaza by ensuring they will not be diverted by Hamas. Last week, the UN announced the temporary reconstruction mechanism was to be launched under the auspices of a newly-formed Palestinian unity government. "We hold the enemy fully responsible for an explosion if the reconstruction does not begin," Abu Obeida said at a rally in Gaza City, warning that "the fight is not over." Hamas official Khalil al-Haya, also speaking at the rally attended by dozens of gunmen and around 1,500 people, called for renewed dialogue between his movement and rival faction Fatah. Hamas and Fatah earlier this year signed a reconciliation deal to end seven years of bitter and at times bloody rivalry, but Fatah leader, Palestinian Authority Chairman Mahmoud Abbas accused Hamas of trying to destroy unity efforts after a series of bombings last week targeting Fatah property. Haya, whose movement has denied any link to the blasts, urged Abbas not to use the attacks as "a means to evade reconciliation" and called on Fatah "to return to a partner-based dialogue." The instance marks yet another crack in the facade of the Hamas-Fatah "unity government," which has been slowly crumbling over the past several months - despite recent efforts to present a "united front" to the international community. The IDF and the Israel Security Agency (Shin Bet) several months ago exposed a large-scale coup had been planned by Hamas in Judea and Samaria to overthrow the PA and Abbas's Fatah party, under orders given from Hamas officials abroad. Since then, Hamas has also refused the PA's demands that it let it supervise rebuilding in Gaza - furthering sowing discord between the two factions. It was also Fatah who exposed Hamas's human trafficking operation of Gaza residents to Europe in October.